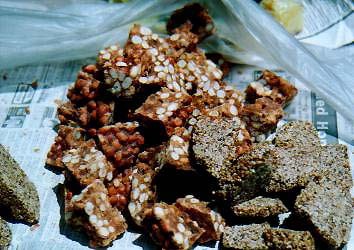 Something between candy and cookie, Eastern Africa's Kashata are a popular snack of Swahili origin. Kashata are usually made with peanuts or grated coconut, or both. Kashata are made on the stove or over a fire, not in an oven like European biscuits or American cookies. In a hot skillet, heat the Sugar until it melts and just begins to brown. Reduce heat and quickly add all other ingredients, stirring well as each ingredient is added. When all ingredients have been added to the mixture, continue stirring for about a minute, making sure everything is well mixed. Pour out on sheet pan lined with wax paper. Cut into squares while still hot. The French Huguenots brought this sweet to the Cape ( ie South Africa) many years ago. The sweets used to be sold by street vendors but today they are made only for special feasts. pine nut kernels, almonds, walnuts or coconut. Dissolve the sugar in water over a low heat, and add the butter. Boil steadily without stirring for a few minutes, until the mixture starts frothing. Add the chopped pine nut kernels, almonds, walnuts or coconut. Pour into a shallow well-greased dish and mark off squares with a wet knife. Turn over and break into squares. I will have to try this recipe as well!